Hi Everyone......It's Annie here from Curious'n' Crafty Treasures blog and I am the host for this fortnights challenge theme, which is 'Dies and Distress'. I recently purchased this blank Burlap Panel and really wanted to alter it in a grungy style. 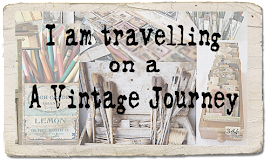 Of course I just had to use my favourite dies and distress products along the way. 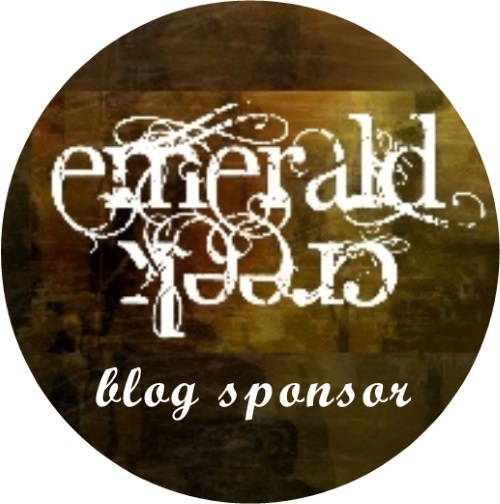 To find out more details, please click on my name above, which will take you to my blog. 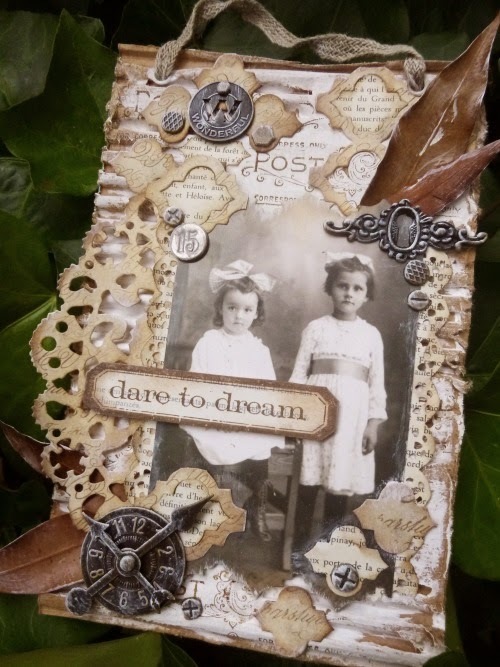 When I think of Tim Holtz I think not just of vintage and distressed/shabby items but his eclectic mixes of elements, his texturing and layers. I love using metal sheets and pattern wheels so to highlight the 'Dies and distress' I have used Tim's distressing and texturing influences, together with his inks, paint, stamps and dies, to create my crown card. The how and the what can be found in my step x step HERE. I decided to alter one of Tim's wonderful Assemblage Clocks. 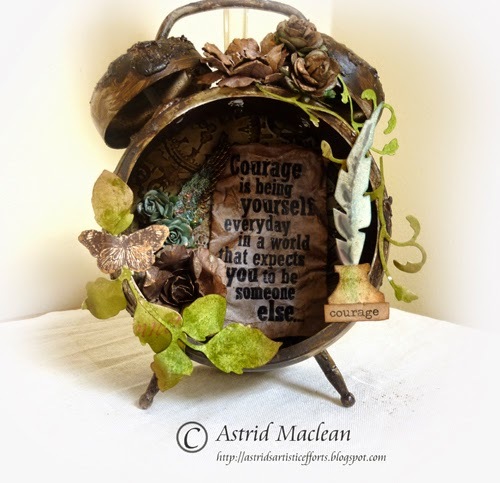 I had great fun playing with a mix of Distress products and both Sizzix and Spellbinders dies. I have a step by step and more photos on my blog. When I first heard the challenge for this fortnight I decided to try a plan I have been thinking about for a while. Using Tim's Dies and Distress together couldn't have been more perfect for this project. There was some construction and lots of experimenting. Now sitting next to my computer I have this distressed calendar/clock so I never happen to miss a challenge date. Stop by my blog here for all the details and step x step photos. 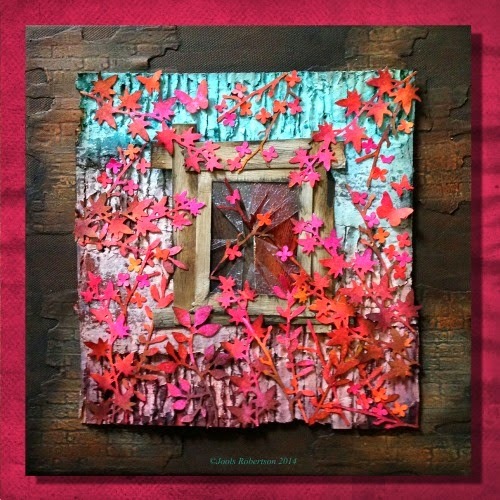 I wanted to do something a little different for this challenge and used Tim Holtz's Butterfly Frenzy die to create a kaleidoscope of butterflies, in soft tones. I used Distress ink, paint and markers and some dry embossing. You can see full details over on my blog HERE. 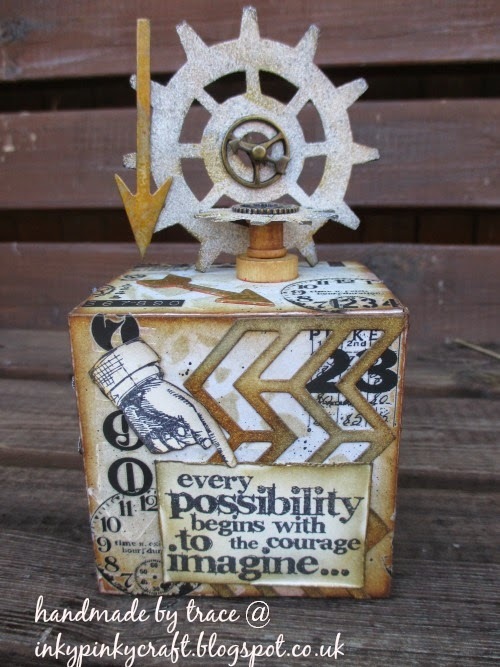 So I wanted to have a play at using my favourite die, the gears and lots of yummy brown distress colours to decorate and create my ATB. I love the possibilities to decorate not only the sides but fill the inside with goodies too! 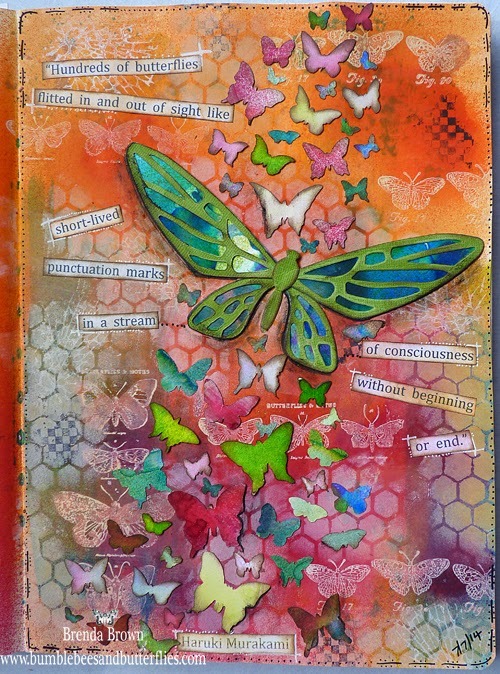 I also used one of the new framework dies, artful arrows and lots of distress inks and paints. To see all the details and the surprise inside please see my blog here. As you can see, it's still a bit autumnal over at Words and Pictures - but there's lots of die-cutting here, as well as plenty of Distress Ink and Paint involved, all on my favourite corrugated cardboard. Do hop over to see more details if you'd like to. Well Alison is autumnal and I am still seeing all the wonderful colours of Hawaii in my head. 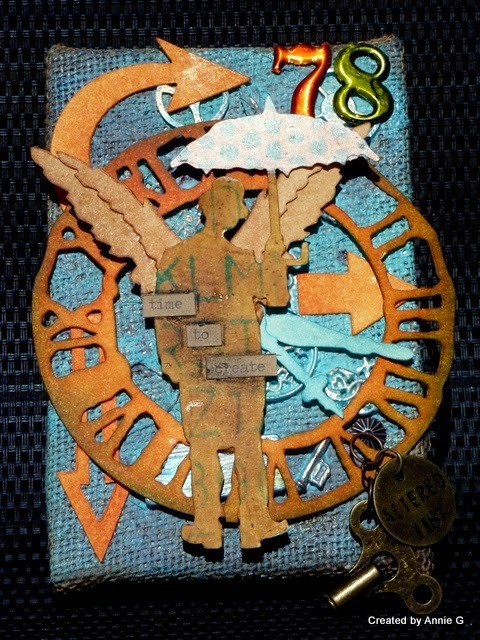 Today I thought I would share a journal page with you, made in my large Dyan Reavely journal which is full of distress products as well as Dylusions sprays and Tim's gorgeous butterfly dies. 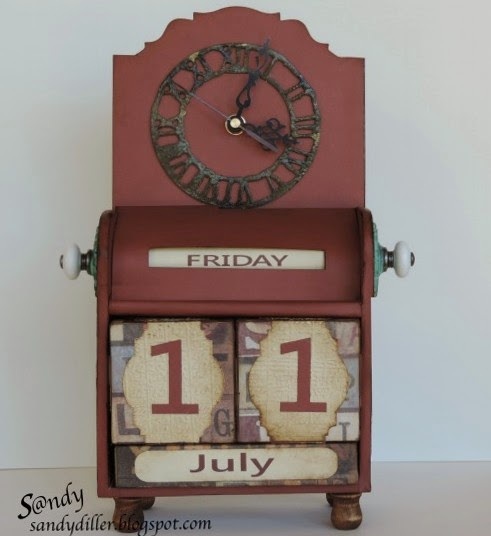 Don't forget your project does not have to be only vintage in style it can be shabby chic, a mixed media piece or journaling style - so I guess you know which category mine fits into lol. For this "Dies and Distress" challenge I went with a mix of Dies and Distress Inks, Paints and Stains and of course adding some Idea-ology along the way. 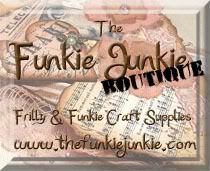 I so love Tim's pocket watch dies and of course a little Rock Candy crackle adds a great distress feel. Stop on over for more details! I love die cutting and Tim’s Dies have to be some of the best in the market both innovative, unique and beautifully detailed. What a great challenge to use lots of them and lots of distress product too! For more detail on my project please click here. I think you'll agree they are amazing projects, and I hope they'll inspire you to play along on this wonderful journey. You have until 6pm UK time on Thursday 24th July to place you entries. This is a great challenge and amazing works by DT's here! There is so much that can be done with inks and dies! Great projects from my team mates as usual. All so different and fabulous. Great inspiration, way to go ladies. Wow, what a talented bunch you are, as if we didn't already know that... love all these projects, fantastic inspiration! What a fabulous variety of inspiration, wonderful projects from all the team, great challenge! What a team! Fabulous creations - can't wait to hop round and see them in detail (though I will have to wait... chores first, then pleasure!!). Wow great projects from the Design Team. Great theme of the challenge. As always the inspiration here is fantastic.